I develop an open-source, system monitoring tool, ServiceMon, and I'd really appreciate some help choosing the right words to use for a feature. 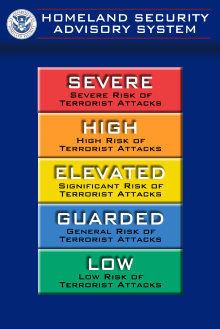 The state of the system that is being monitored is represented using a named severity level. The level changes when the number of errors, recorded within a given time period, breaches a particular threshold. I'd like to give each level a name, which will be used when configuring custom colours and threshold values. I'd ideally like to use meaningful adjectives - rather than cold, generic names like ErrorLevel1, ErrorLevel2, etc. Do the words I've chosen seem appropriate? Can you think of any better alternatives? I envisage ServiceMon being primarily used as an "information radiator" - a permanent presence in a room that provides immediate visual notification of a system's state. Each ServiceMon instance is designed to be lightweight so that many can be tiled on one screen, with each one tracking a different system, or different aspect of the same system. For example, where a system is being monitored for availability and responsiveness, I would envisage a separate instance running for each aspect, each with its own specific thresholds. My first thought is that most people will abandon the secondary naming scheme you assign each colour, and will probably call each state by its colour. The first real-world example of this behaviour that comes to mind is the American Department of Homeland Security's (discontinued) colour-coded threat level warning system. My gut hears more sysadmins looking at their monitor and calling their supervisor saying "Yeah, we're in the red on example.com" rather than "We have a dire-level warning on example.com". No street racer anywhere says that "engine speed is invading the critical band"; they say they're redlining. Colors alone are not enough. For example the image included by msanford in his excellent answer would be meaningless if printed in a monochrome laser printer. The meaning of colors might be affected by culture. I recall having read that in Japan mourning people dress in white. In China the red color is so common in decoration that a red alert might rest unseen. The sense of growing levels can be conveyed by numbers and size. Numbers combined with other elements. ErrorLevel1, ErrorLevel2 are not good because they lack identity: almost the same text with only one different character at the end. Colors alone do not convey much information for people who are colorblind, like for example me and a significant portion of the male population. severe: humongous on red background. This way the non English speaking user can rely on the numbers without having to fully understand the words, which might be quite difficult to accurately translate to every language. This way the words choice will not be that critical. Like in the Homeland Security levels, whether you assigned a name or not, you can always add a detailed description for the users to read if they are unsure of the meaning of the error level. IMO people would end up calling the levels by their numbers. This is so for earthquakes and it works. As of the Homeland scale, people name the levels by their colors. I suggest that you do some user testing with the Homeland scale, to check if most people remember the colors but not the names. If so, then stop worrying too much about the names. Not the answer you're looking for? Browse other questions tagged desktop-application names errors or ask your own question. Fusing words for website name: confusing or doable? Error handling - what to do with large error list?